Small Parts Rotators are very effective for processing components with deep blind holes such as screw machine parts and/or recessed areas such as small complex tubes. 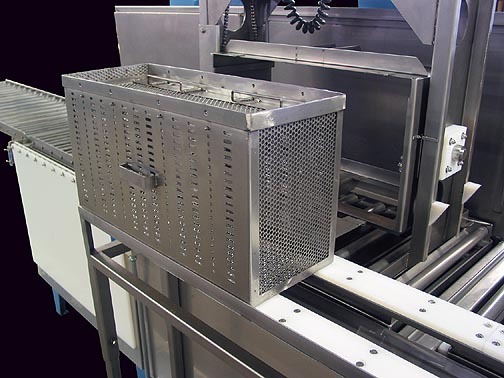 Special baskets limit the tumbling of parts thereby protecting delicate surfaces. Each rotator is separate, detachable and can run off of an overhead electrified track throughout the system. The system shown above was built in the late 1980s. It is an eight station closed loop semi-automated system for final cleaning prior to packaging, It includes conveyors, overhead electrified track and multiple Small Parts Rotators for material handling from station to station. The process is designed for washing, rinsing, bright dipping and spot free drying of brass and copper screw machine parts as well as washing, rinsing and drying of steel parts. All contaminants including chips and oil are removed from a wide variety of alloys and configurations with difficult to clean deep blind holes. Five stations are dedicated to processing brass and copper. Three stations are dedicated to processing steel. The system produces one seventy-five pound load (two baskets) every five minutes and processes over one million pounds of product a year. 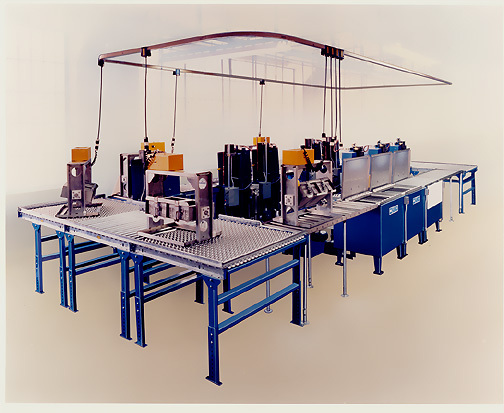 The system shown directly above was built in 2002 for a manufacturer of simple and complex tubing (up to 23″ long). The system consists for four stages – Wash, Overflowing Rinse, Cascading Rinse and Hot Air Knife Dryer. The line runs right to left. Two Small Parts Rotators are used for the system. The rotators are transferred only between the Wash and Overflowing Rinse and between the Cascading Rinse and the Dryer. 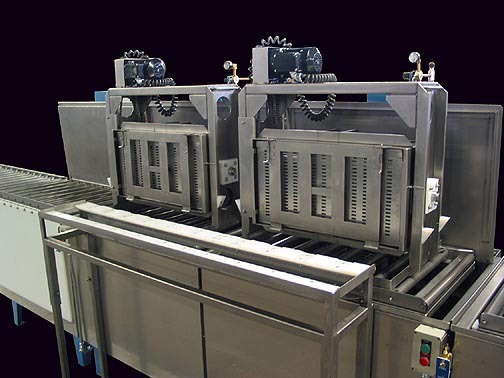 The baskets are transferred from one rotator to the other in between the Overflowing Rinse and the Cascading Rinse using a specially designed transfer table and rotating carriage. A key element in the system is the basket configuration. Tubes are loaded from the short side (see below) allowing the rotating carrier to be built in a compact working zone. This design makes it easy to reach, unload, transfer (down the line over low friction slide strips) and load (a basket) into the next rotator (stage) with minimal effort. The line allows for cleaning straight tubes as well as complex tubes. The straight tubes a loaded into standard baskets and cleaned using RapidFlow processing with lateral turbo headers and MultiPort Oscillation. In this case the rotators are “parked” onto the extended loading and unloading conveyor sections (see line photo above) clearing the platform roller conveyors for standard basket transfer. Drying is accomplished in both cases using our Hot Air Knife Dryer with variable temperature control. The customer intends on purchasing two more rotators in the future and setting the line up for complete basket transfer (keeping all four rotators stationary). In this scenario we will extend the sliding transfer table to accommodate all four stages. 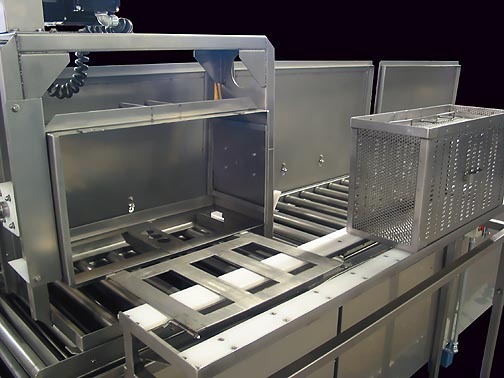 The sliding rotator basket system can be built for most MK and Console Systems (dependent on the part size, weight and overall basket configuration). It is a very useful arrangement as it eliminates the need for electrified tracks and transferring rotators. Please consult the factory for pricing.